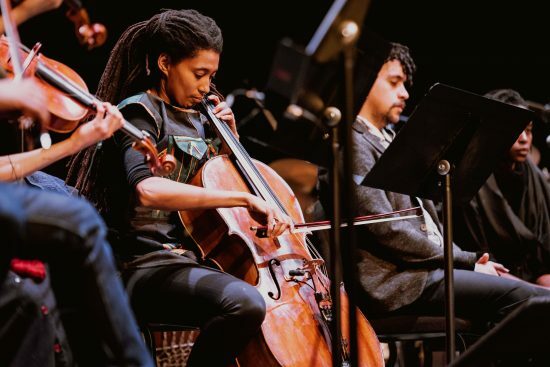 Knoxville, Tenn.’s determinedly eclectic Big Ears Festival celebrated its 10th anniversary with a packed long weekend of boundary-stretching music from March 21 to 24. 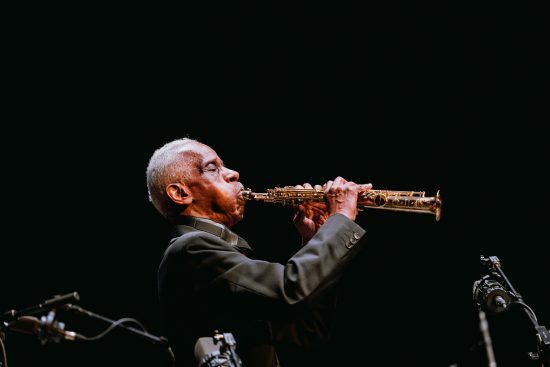 Rather than spend too much time trumpeting its own first decade, the festival chose to shift the spotlight to two even more impressive landmarks: the 50th anniversaries of both ECM Records and the Art Ensemble of Chicago. 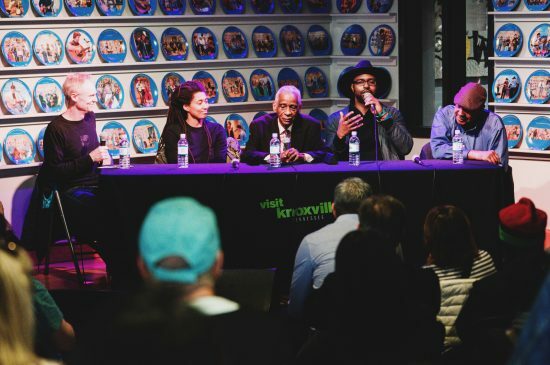 While those two marquee celebrations put different strands of jazz’s far-reaching tradition at the forefront, calling Big Ears a “jazz festival” would be ignoring a significant portion of its open-minded mission. While founder Ashley Capps rejects the “avant-garde” tag, it’s as good an umbrella as any for the range of music and art that takes over Knoxville’s downtown for that early-spring weekend. For those of particular tastes, it’s easy to cram a schedule full of stellar examples of one genre or another. Jazzheads could easily lose sleep and wear out soles running between multiple performances by the likes of Bill Frisell, Tim Berne, and Mary Halvorson; new-music aficionados could take in concerts by Alvin Lucier, Arvo Pärt, Bryce Dessner, and Harold Budd; and adventurous rock fans could keep the earplugs in for Spiritualized, Mercury Rev, Avey Tare, and so on. It’s more in the spirit of the festival, though, to veer between such far-flung poles. This is the kind of event where one can start the day meditating on the nearly imperceptible accruals and glacial evolutions of Lucier’s music as performed by the Ever Present Orchestra, then trek up the hill to briefly submerge in the heady audiovisual whorl of Rob Mazurek and Emmett Kelly’s Alien Flower Sutra, en route to the tensile song sculptures of Halvorson’s Code Girl. The latter set was highlighted by the guitarist and trumpeter Ambrose Akinmusire scurrying around one another’s darting lines like a pair of feisty squirrels. On record, Code Girlconcentrates on the skewed lyricism of Halvorson’s songs; live, they’re even further abstracted, sending vocalist Amirtha Kidambi into piercing shrieks and guttural growls or pitting Akinmusire and drummer Tomas Fujiwara into a pugilistic battle. The first of the ECM-focused performances presented the captivating duo of Bill Frisell and bassist Thomas Morgan at the Standard, one of several repurposed industrial spaces that make Knoxville’s revitalization evident even to first-time visitors. The sense of place was reinforced by a train whistle blowing as if on cue as the duo launched into a free-roaming rendition of “Lush Life” that unraveled and drifted in relentless search, with pieces of “Moon River” and other tunes wafting by along the way. In the pair’s deeply attuned hands each piece, from a couple of Monk tunes to “Save the Last Dance for Me,” seemed to cohere from raw sound like sculptures taking shape in real time. St. John’s Episcopal Cathedral seemed the most appropriate venue for ECM artists, given label founder Manfred Eicher’s love of reverberant space. It was ideal for Larry Grenadier’s stunning solo bass set on Friday afternoon, where every piece was virtuosic but eloquent, akin to listening to a gifted orator expound. The set was remarkably varied, largely culled from his new album The Gleaners, ranging from the overtone-laden ache of “Oceanic” to the agile pizzicato swing of “Pettiford.” Grenadier’s mashup of Coltrane’s “Compassion” and Paul Motian’s “The Owl of Cranston” split the difference, the pendulum swinging from a spiraling, prismatic keen to the urgent entreaty of a folk song. Later that day guitarist Ralph Towner gave his own solo recital, hinting at flamenco touches on “Saunter,” from his recent release My Foolish Heart. Towner used the album’s title tune, played with a shimmering tenderness, to joke about his recent triple bypass surgery, saying that he was feeling and playing better than ever after the operation. “If you get a chance, have one,” he chuckled. It was one of the weekend’s most jarring transitions to leave Wilson’s joyous set and wander into the darkened (save for the sunlight streaming through the intermittently opening doors) Mill & Mine to be overwhelmed by the oppressive drones of KTL. A duo comprising electronic musician Peter Rehberg and Sunn O))) guitarist Stephen O’Malley, KTL offers a tidal wave of crushing noise, laced through with borealis-like waves of glistering feedback. 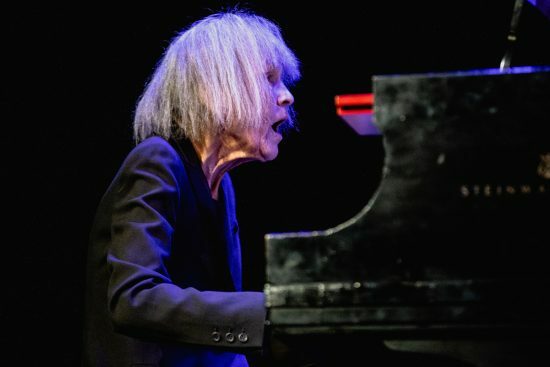 The pendulum then swung back the other way, as Carla Bley’s trio with Steve Swallow and Andy Sheppard played an entrancing set at the opulent Tennessee Theatre as part of the ECM series. The set largely focused on Bley’s newer material, beginning with the three-part “Copycat.” The opening section featured a tender melody made even more so by the held-breath fragility of the trio’s playing—Sheppard airy, Swallow gentle—that suggested the whole thing might shatter at the least pressure. The tune then took a turn for the angular, imbued with Bley’s trademark droll playfulness. That came even more to the fore on the evening’s oldest piece, “Three Banana,” which the pianist riddled with witty dissonances and offbeat accents. From one high point to another, very different one, as This Is Not This Heat took the stage back at the Mill & Mine. The sextet began life as the British art-punk trio This Heat in the late ’70s; after the death of bassist/vocalist Gareth Williams in 2001, the other two co-founders, Charles Bullen and Charles Hayward,eventually decided to reunite under this self-negating name in 2016, playing only a handful of shows (Big Ears was planned to be their last ever in the States). With two drummers, three guitarists, clarinet and keyboard, the band rapturously combined aggression and precision, navigating hairpin turns in the music, delivering blistering sermons and erupting into laser-focused chaos. It was an exhilarating performance, one that with any luck might make them rethink their decision to call it quits once again. While there were difficult choices to be made throughout the weekend, consensus finally seemed to form for the final performance at the Tennessee Theatre on Sunday night, as the Art Ensemble of Chicago closed the festival to a full house. With co-founder Joseph Jarman having recently died, joining Lester Bowie and Malachi Favors in jazz Valhalla, only Roscoe Mitchell and Famoudou Don Moye remain to represent the band in its classic form. Given how central the chemistry and identities of those five artists were to the Art Ensemble’s distinctive sound and approach, its current incarnation is somewhat contentious. Perhaps it’s a true testament to Jarman, Bowie, and Favors that it takes a 15-piece band to capture the full range of their abilities. 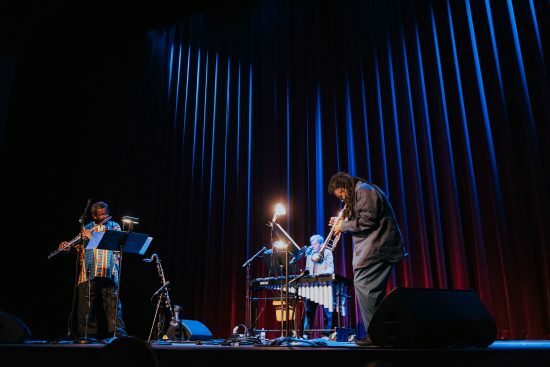 Earlier that day on the same stage, AACM compatriot Wadada Leo Smith had paid explicit homage to Bowie, playing along to a recording of “Tastalun,” the trio improv he’d played with Bowie and Kenny Wheeler on 1979’s Divine Love. Nothing quite so overt took place during the Art Ensemble’s performance. As always, the group was intent on the next thing, not the past, whether that be an explosion of mass improvisation or elegant chamber pieces that saw threads of melody picked up and passed from member to member. 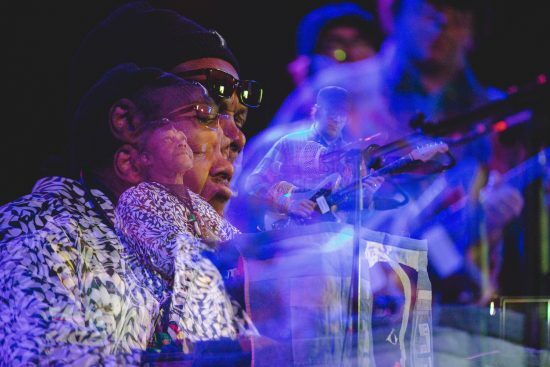 Throughout the set Mitchell could often be found with eyes closed and head down in the center of the squall, like a dreamer conjuring the sound into being; then he suddenly rose for a jaw-dropping extended circular-breathing solo on soprano, gathering the sound of the ensemble around it. There are arguments to bemade about whether this version of the band can truly carry the name, but for 50 years there has been nothing else quite like the Art Ensemble of Chicago, and this stirring, inventive set was vigorously, vehemently like the Art Ensemble of Chicago. 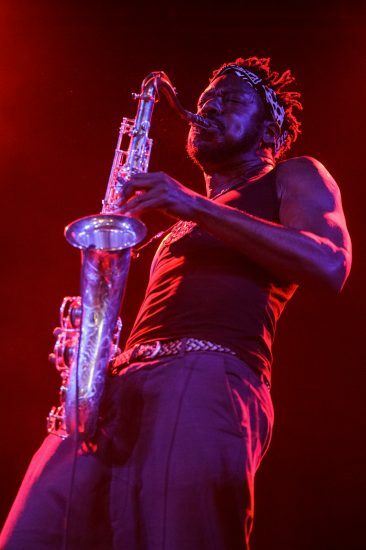 London’s Shabaka Hutchings performs with The Comet Is Coming. 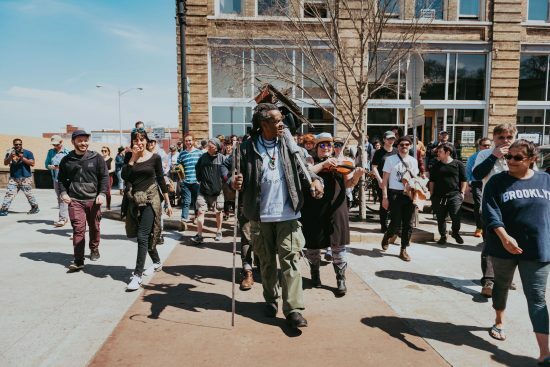 Artist, art educator, and musician Lonnie Holley leads a walking tour on March 24. Lonnie Hollie and the Messthetics perform.